What Do IT Guys Have Against Financial Advisors? People who work in the same industry obviously have a lot in common. Educators care about education, business executives care about business, athletes care about sports. Those similarities do not necessarily extend to investment decisions, at least not 100 percent. For all that business owners have in common, they each have their own exterior pressures related to their age, health status, location and family. However, people in the same industry are likely to have some similarities outside of the workplace, and investment strategies seem to be one of them. Spectrem’s recent wealth segmentation study examined the advisor relationships of affluent investors based on their occupation and found that there are specific attitudes and behaviors that Senior Corporate Executives have in common, and those behaviors are different from the advisor relationships held by Professionals such as lawyers, doctors and accountants. Among Millionaire investors with a net worth between $1 million and $5 million, the Spectrem study looked at investors in five different occupational categories and found that, in general, investors who are in Information Technology fields tend to avoid using financial advisors more than others. When IT professionals do use advisors, they are less satisfied and use their advisor to a lesser extent than do investors from other walks of life. Advisors who have clients from the world of information technology may sense these clients have a different approach to investing. They tend to be younger than investors in other occupations, and their expertise in technology makes information easier to acquire than it is for others, simply because they know where and how to look for it. Starting at the beginning, 30 percent of Information Technology Millionaires do not use financial advisors. That is a much higher percentage than investors in any of the four other occupations studied: Senior Corporate Executives and Managers, Educators, Professionals and Business Owners. Of those IT investors who do use an advisor, 70 percent use only one, and again that percentage is much higher than the percentages of investors in any other occupation. Those two insights indicate a wariness among IT Millionaires to involve advisors in their finances and investment decisions. Advisors working with or attempting to attract IT Millionaires need to know they are working with very careful investors. What is the source of their wariness? More than two-thirds of IT investors who do not use a financial advisor said they do not believe advisors have the interests of their client at heart. That is double the 38 percent of Business Owners who do not use a financial advisor and question the motivation of financial advisors. 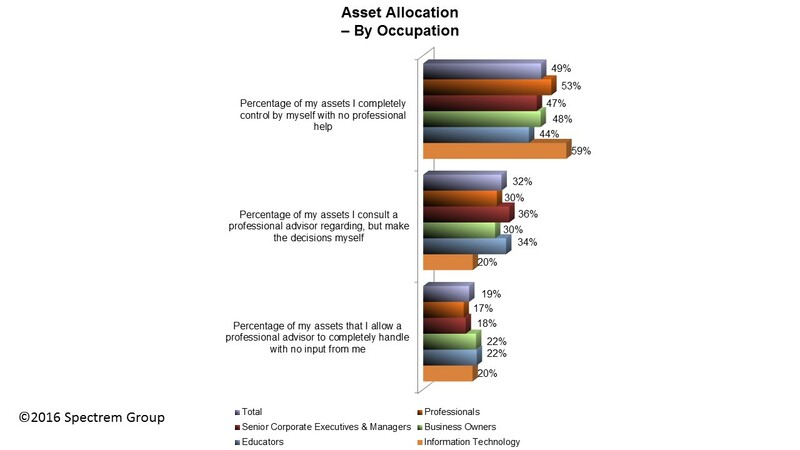 IT Millionaires also report a much lower level of trust in financial advisors than do investors in other occupations. It is much lower than the trust Senior Corporate Executives have. It is noteworthy that IT Millionaires also have the lowest trust among all occupations in their primary care physician, personal attorney or personal accountant. So are the IT Millionaires who use financial advisors different from those investors in other occupations? IT Millionaires keep a much greater percentage (59 percent) of their assets to invest themselves than do investors from other occupations. They only turn over 20 percent of their assets over to a professional advisor, and keep 20 percent in which they consult a professional advisor about before making investment decisions. Sweeping generalizations are dangerous, and no two investors are alike, but investors from an IT background seem to have a distrust or dislike for financial advisors. However, many people in the IT business are wealthy and could use the services of a financial advisor. There is no reason NOT to advertise in places in which IT professionals might look, such as all internet opportunities. You never know when an IT investor will decide they could use some help with their investments.